The Doppler Weather Radar has been undergoing repairs and today [Aug 30] appears to be functioning under testing status. 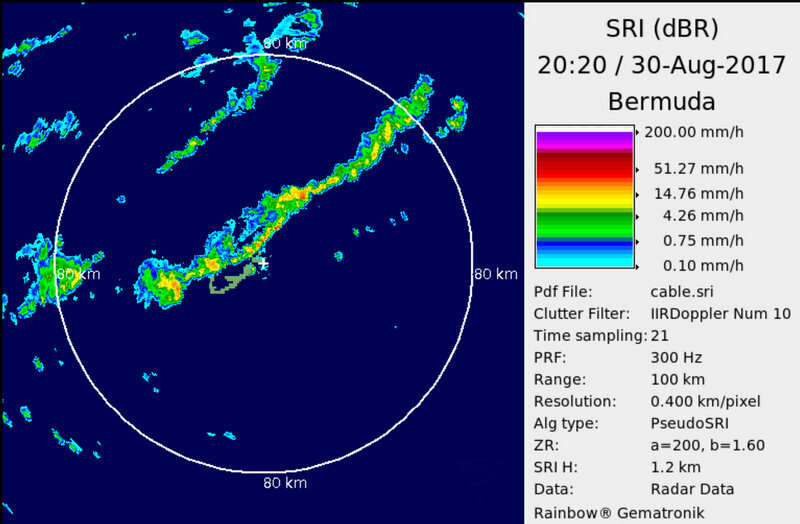 The Bermuda Weather Service Doppler Radar page has a notice that says, “Under Test. Expect Radar Imagery To Be Unavailable From Time To Time For Extended Periods While Repairs Are Conducted! The Bermuda Airport Authority assumed responsibility for the former Department of Airport Operations weather radar system in March 2017. The weather radar system at Cooper’s Island was originally installed in 2004 and is now approaching the end of its useful life, according to officials. A Bermuda Airport Authority spokesperson previously said, “Recently, the system has become increasingly less stable with more frequent outages and the need for specialized maintenance and replacement parts, some of which have to be manufactured overseas. “The weather radar system was last operational in mid-June 2017 and, since then, several efforts have been made to repair it. Earlier this month the German manufacturer sent an engineer to Bermuda to work on the system, however, it remains out of service. “Additional replacement parts are now due to arrive within the month and, pending success of the repairs, the weather radar system could be back in operation by mid-September. Not a hint of diligence about this: over the last few years the radar has been down more often than not and with courier services able to send parts in days the negligence of the one useful service the Bermuda Weather “Service” provides is a mess. Nice timing for the reinstatement as it coincides with the end of the boating season! What is the source of your “negligence” comment? Do you know something the rest of us don’t know? Please enlighten us with your knowledge. Negligence: failure to pay sufficient attention or care to someone or something you are responsible for. Clear enough now? U need a source?! Have u ever tried to use it? 95% of the time it doesnt work. Ie negligence. Smh. U must work there. Lol. Best news all freaking year!